Welcome to the 21st century – a time where every buyer is overwhelmed by the variety of choices and options available. 2018 is the best year for car seats so far, as there are more and more models coming every single month. More importantly, the technology has got much more sophisticated. With that, car seats became a lot safer and more comfortable than ever before. Still, buying premium convertible car seats is an expensive business (especially if you have more than one child – or more than one vehicle). However, there is no getting away from the fact that you need to invest and get the best for your kids. When it comes to car seats, this is definitely the case as they are an option that gives you more than 2-3 years of use and three different positions that suit your growing child’s needs during every year. Price differences – There are convertible car seats that are as affordable as $39 and then ones that are priced at $699. Obviously, there is a difference between the two which is why we are reviewing the ones that are priced below $200 and offer great value for money. Rear facing – Different seats have different rear facing capabilities which is why you can go with some of the less expensive seats at first that offer the very best of rear and front facing positions. Height and depth – If you cannot see the back window of your car because of the convertible car seat, you should not even get it. Same goes with depth and the movement of the driver or front passenger seat. The idea is simple – height and depth always matter. So, how does paying $200 for a car seat that you will use 8 years sound? For us, it sounds pretty unbelievable. Below, we are listing our top picks. 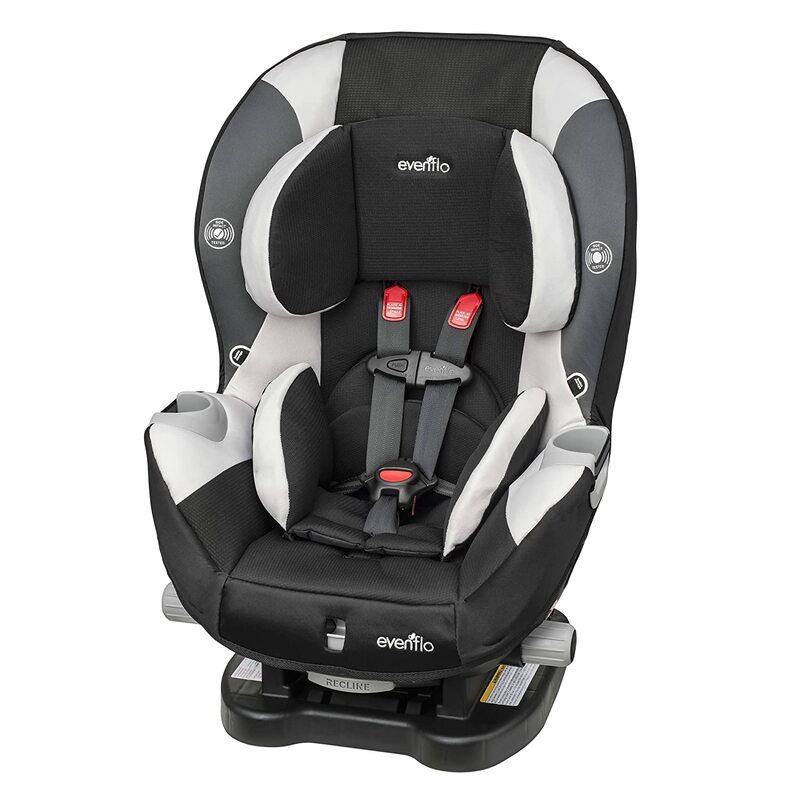 If you aren’t new to children’s car seats, you probably know that Evenflo makes some of the best baby products at the lowest possible prices. A proof for that is this car seat named Triumph LX which is basically one of the best convertible car seats you can find on the market. 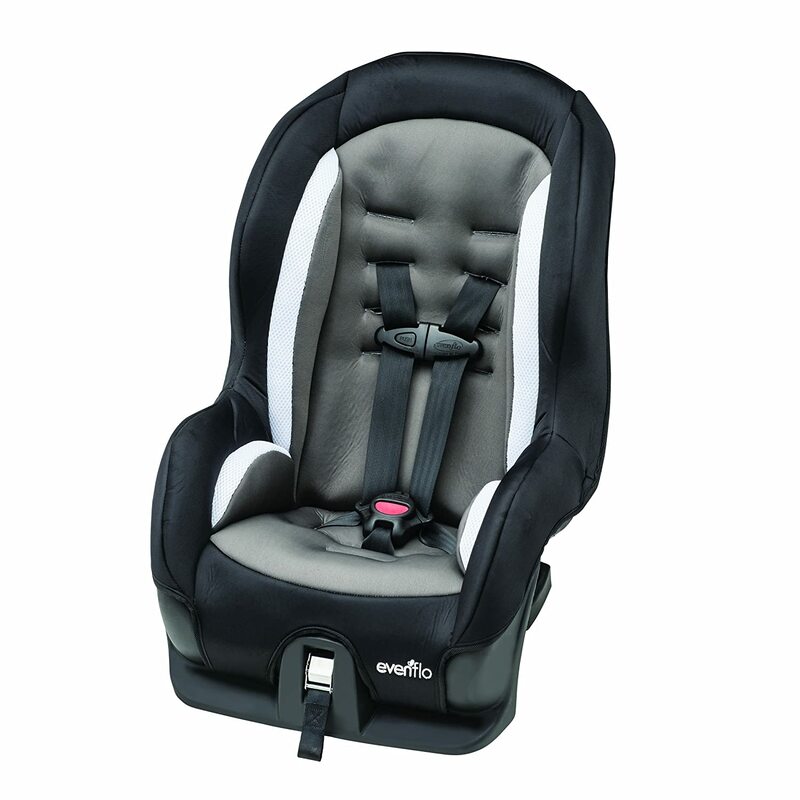 Designed and made by Evenflo, this car seat is priced below $200 and has a great weight range, a set of nice features and support for infants that weigh as low as 5 pounds rear-facing with special infant inserts. Later on, they can switch to the front-facing position (up to 65 pounds). Even though (unlike the Evenflo Symphony) this car seat does not convert into a booster seat, it includes most of the other goodies that come up with the Symphony. These include the LATCH connect system, the two cup holders and the 5-point harness which offers a conveniently located recline lever in its front, no-rethread adjustable shoulder harness and two cup holders. The fact that there is no strap up front for tightening the shoulder harnesses is great. Instead, there are two large ratcheting knobs placed on the bottom. All you need to do to tighten them is to spin the knobs and you are good to go. If you wish to loosen them, you only need to push a button and therefore prevent any issues with the tightening strap. All in all, this is a great product coming at an excellent price – which you can use for newborns, toddlers and children weighing up to 65 pounds. The Graco Extend2Fit convertible car seat is among the most versatile, safe and a car seat with some of the best features. The seat supports from 5 to 40 pounds (rear-facing) and 20 to 65 pounds (forward-facing). This gives it a slightly higher upper weight than most of the products in the same category. The fact that this seat doesn’t support booster mode is something that shouldn’t bother you much. For less than $200, you are probably unlikely to be using the seat on a child over 50 pounds which is when you will decide if you want to switch to a booster seat (or not switch at all). What’s important to note about this seat is the fact that it uses a 5-point harness, is side-impact tested, has EPS energy-absorbing foam in most of its add-ons and parts and the InRight system that the brand uses in the more expensive models. The most awesome part about this car seat under $200, however, lies in the adjustable headrest and shoulder harness positioning system that does not require re-threading. 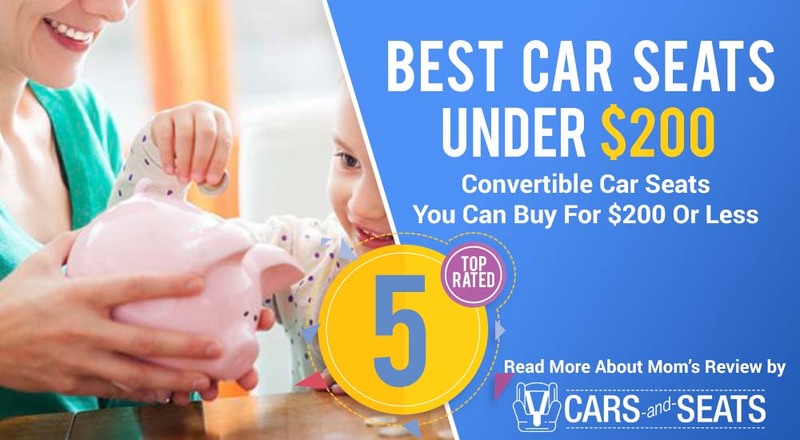 This is something that is very rare for a convertible car seat in this price range – and a factor that makes a big difference to ones looking for a premium convertible car seat for their loved ones. The cloth is also soft and easy to clean which is why this convertible car seat gets all the good grades on the market. For many people, this convertible car seat is the right decision. If you are looking for something budget-friendly (because of all the spending on diapers) and something that keeps your child cool and safe, this is a product to choose. Plus, it perfectly fits in most sedans and the passenger doesn’t have to move their seat forward. So, what more could you ask for? 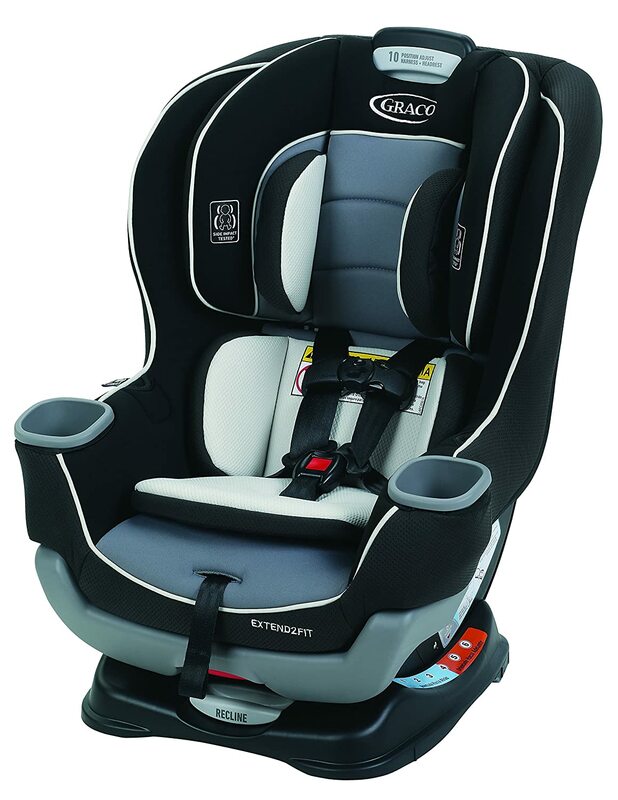 This car seat is quite similar to the Graco Contender and offers quite the same versatility and features. The price is also very similar. The convertible car seat basically supports the rear-facing, front-facing and booster configurations and in that way, supports children from 5 to 100 pounds. So, while most of the other semi-convertible car seats are great in their rear-facing and front-facing modes, this one also offers a booster mode for the time when your baby becomes big and needs a booster. Even though the seat may get pretty tight when trying to use it as a booster, it uses a 5-point harness, has side impact tested technology and the LATCH system. Whether it’s a rear-facing position for newborns and toddlers or the forward-facing ones for children that are quite older, this seat exceeds many people’s expectations. 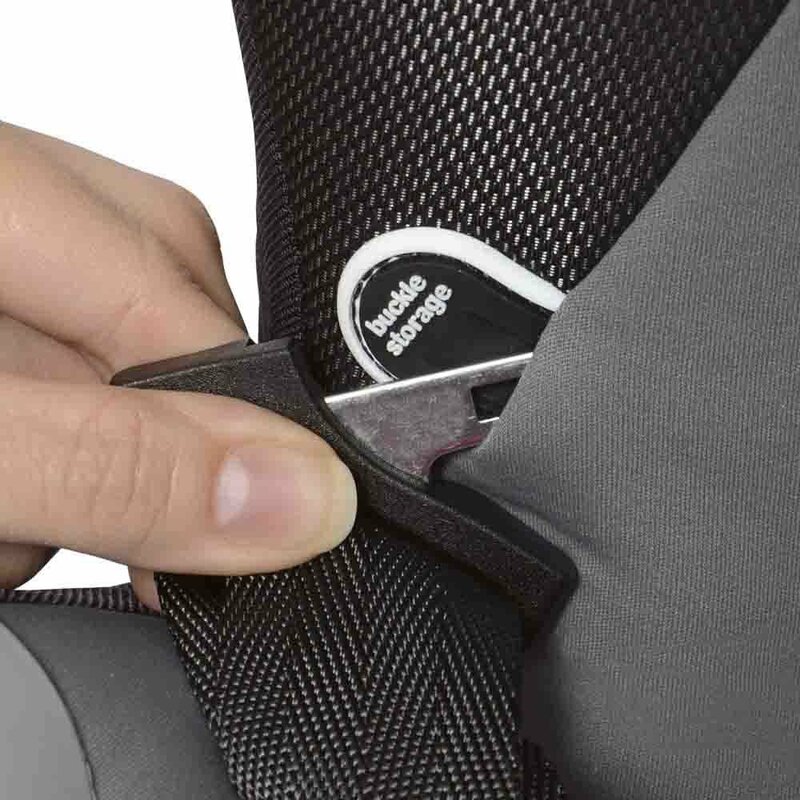 If your child is ready to use the vehicle seat belts, there is a booster mode for a safer seat up to 100 pounds. In both positions (rear-facing and front-facing), the harness holders keep the harness out of the way which makes it amazingly simple to get your child in and out of the seat. You can adjust the height of the headrest and harness with one hand – in a very easy step. Just like the Britax, it has 3 recline adjustments which are nice and an adjustable headrest and shoulder harness height that doesn’t need any rethreading. The price is a big plus too – just like the fabric softness and comfort provided altogether. The Air Protect system has proven that it is one of the safest out there thanks to the cushioning and amazing padding that will protect your children at all times. This convertible car seat is another one in the list of less expensive convertible car seats. It is about $100 cheaper than the premium convertible car seats yet brings a lot of great features and therefore competes with some of the better seats out there too. Even though some parents dislike its design (saying that there are prettier seats out there), the Graco My Ride convertible car seat has some great features. 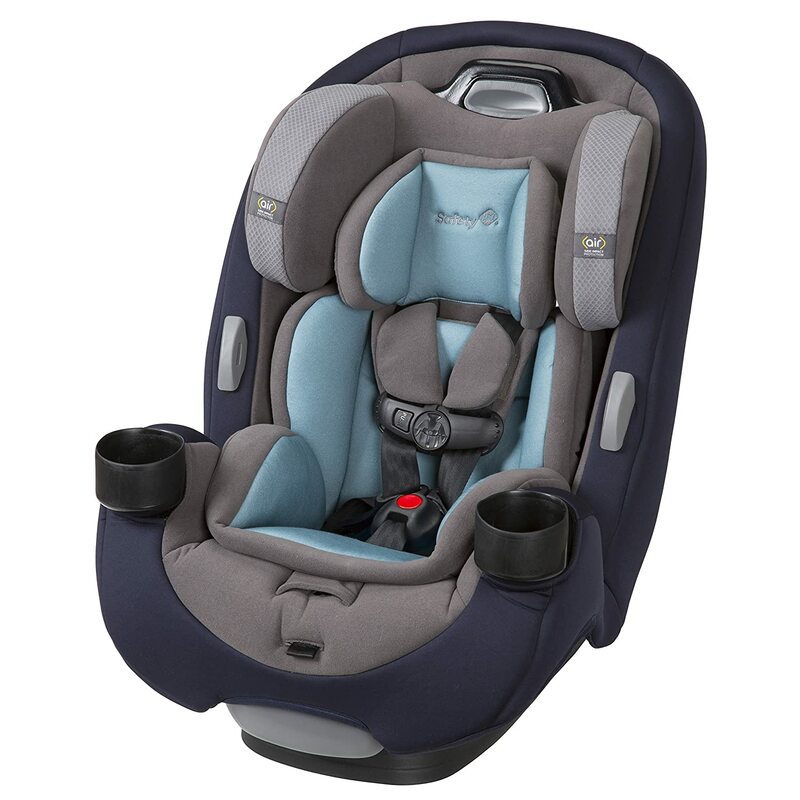 It offers a great weight range from 5 to 40 lbs for newborns and babies in the rear facing mode, as well as up to 65 pounds for toddlers in the front-facing mode. This is according to many a fantastic range and something that we can compare to the premium seats. There is also a 5-point harness with the LATCH system which means that you can remove the cover, throw it in the washing machine but also use the newborn inserts and headrest for the best comfort of your newborn baby. According to the manufacturer, the five point harness makes securing your kid easier and removing them quick and simple. The latch equipped technology, on the other hand, offers rear-facing seating for children to 40 pounds with a hassle-free installation. In a nutshell, this is one of those convertible car seats that have all the great features and provide comfort for a growing child by including the removable body support. For many, this convertible car seat gives a great bang for the buck (if not the biggest one). Tested for its structural integrity at both high and low temperatures, it comes from a brand that is well-known on the market. This is one of the cheapest convertible car seats for newborns, toddlers and children weighing up to 40 pounds. It is a lot easier on the eyes than other models – in fact, its minimalistic and overly simple design makes it a classic car seat to choose for under $200. The Evenflo Tribute Sport can fit many vehicles and has a cup holder. The side impact tested technology by Evenflo is also here and the shoulder straps are easily adjustable by tightening them. Among the list of cons are the fact that there are no infant add-ons – only a removable head pillow. However, according to many this is not sufficient to keep the newborn’s head stabilized in a vehicle. That is why we wouldn’t recommend this convertible car seats for newborns – only for toddlers and children. At around 9 lbs, this is also one of the lightest convertible car seats out there on the market. It is easy to install, easy to carry and easy to transport which is why some parents even use it in planes, trains and buses. 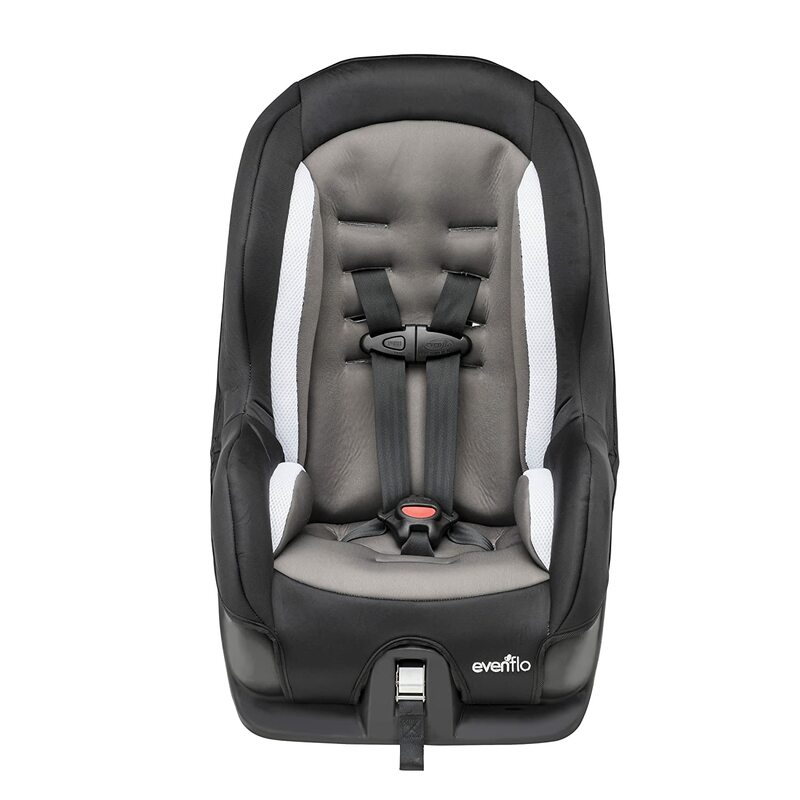 What’s most important is that the Evenflo Tribute Sport Convertible car seat is a product that is affordable yet gives you an awesome value for money. We all know that choosing a convertible car seat for children is a tricky process. However, thanks to the help of the Internet, there are always options and detailed reviews to help you find the right product for your needs. If you are looking for a more budget friendly options, check out the best cars seats priced under 100$. 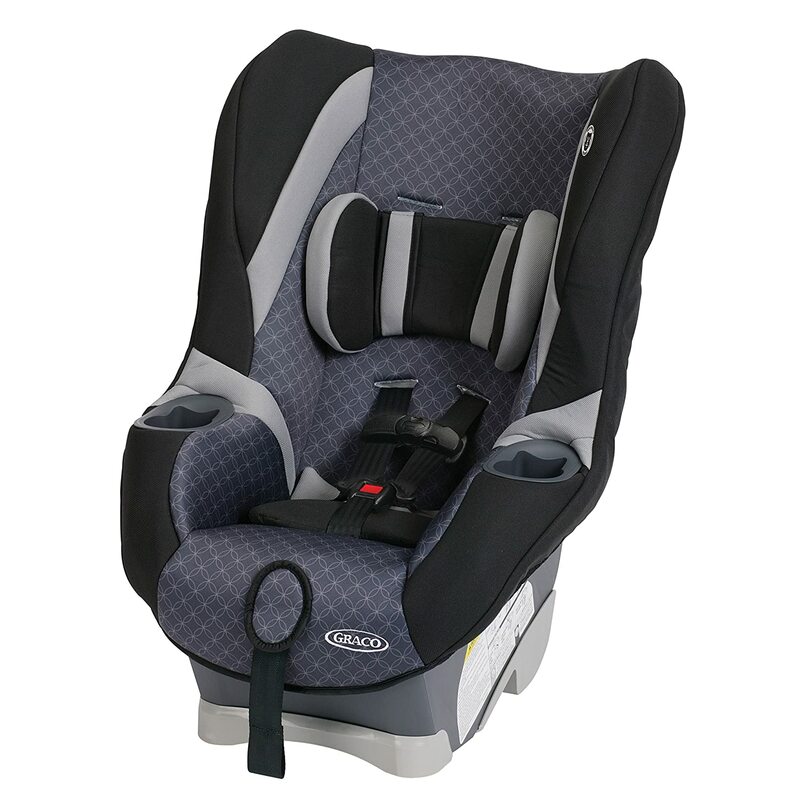 After all, it is easy to check out our car seat reviews than buy and expect the best from any product that you choose. The best way to narrow down your search from all of these options is to research each piece separately, see if it fits your vehicle and make sure that you are making the right decision. We hope that our review of the best convertible car seats under $200 helped you make most for every dollar. Good luck!